This is my 2nd installment for this months jewelry challenge and I decided to go simple. 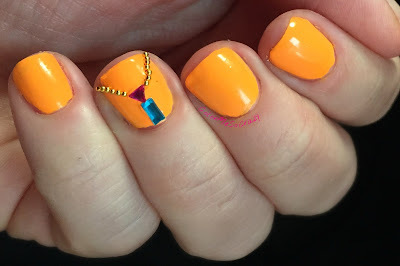 I used one of my favorite summer colors because I have decided to squish as much summer as I can into these last two weeks. This colors makes me look super tan, so I love it! 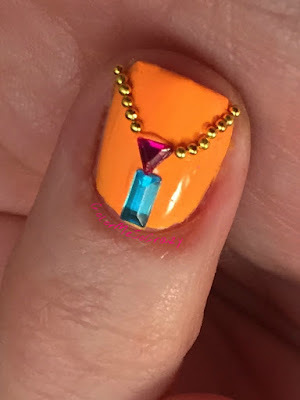 I used simple studs and jewels to construct a mini necklace on my nail. I love this because it kind of reminds me of a little Barbie necklace or something that I used to play with when I was little. One good thing about having super tiny hands is that you can pick up little tiny jewels easier. 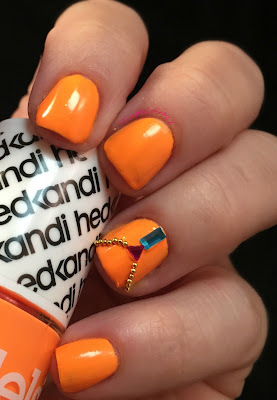 It just stinks that I couldn't do more of a design because my nail beds are sooo tiny! I still love these! !